This is like TWO of my normal positions because it is a $90 stock. For my portfolio size that’s too much. I’d need a base of about $200,000 for it to make sense. Wish that splits would come back into vogue. Expensive stocks don’t matter for the big guy, but the little guy has trouble trying to keep diversified. This is really a CSP on UTX at the 90 strike. Another one of those days. Was able to buy back BBY CSP and sell the COP as the market crashed. Also closed out most CC’s in the last couple of days locking in the cash flow from them. See list for the last fkhr trading days below. Not wonderful, but better than I thought it would be with this crash—just $375 positive cash flow. Not so pretty on the M2M “value” side of things, but the cash flow continues…. Also bought back three CC’s for a nickel or less. At least that eases the pain of falling share prices of held stocks. See transactions at end of this message. 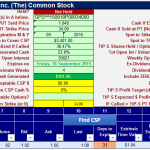 Sold a CSP on HAL for $1.40 and time within the TtP-S 100 day goal. Good premiums because the business case for oil businesses is weak. But I’m not overloaded in that sector (too much). The 1.40 beats the PT of 122.87. Of course who knows if I’ll be forced to bu the stock at 39 to my detriment. But I DO know I’ll keep the 122.87, and at worst hold a depreciated stock that requires CC selling. See below for GPS particulars.